Good morning! I'm not sure what it is about the love not sized card (3" x 3"), but I just LOVE them! They are large enough to be a "card", but small enough to hidden in a loved one's bag, briefcase, or purse (for them to find later)! Instead of the regular card, I decided to make a Tri-Fold card...but trimmed it down to the love note size. Did you all read Taylor's post yesterday? The Taylored Expressions store is now back to their regular shipping schedule! Beautiful card! So elegant yet earthy. I was hoping to see a view of the card open since it's a tri-fold, and exactly what size is it? 4x4? I would imagine that it's a bit harder to make a tri-fold card this small. You did such a great job. Love the sentiment, flower and edging. Again, it's just beautiful! Thank you for sharing! Your card is so cute and shabby. I love the way the sunflower brings it all together as a whole! 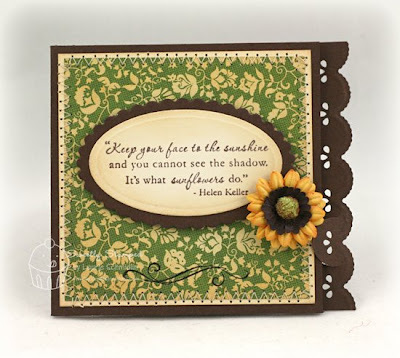 Love that brown scalloped border with the big yellow sunflower! Pretty!